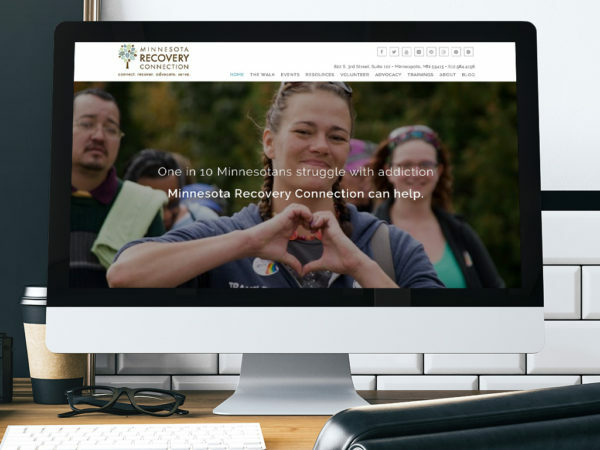 Minnesota Recovery Connection is the state’s go-to resource for the drug and alcohol recovery community. But its outdated, static website was hampering its mission to provide useful and helpful information to the recovery community. MRC’s leaders asked us to sharpen their messaging by overhauling the text-heavy, unwieldy website. Consulting. The first step was analyzing how MRC’s work had evolved since the old website was built. While the overall mission of the organization had remained the same, some of the services they provided had changed, and it was important that that be reflected on the new site. Content. As with all of our web design projects, we took a content-first approach to what the new website would look like. We interviewed stakeholders across the organization multiple times to understand what they did and how it impacted their constituency. Then we crafted search engine optimized content, keeping the needs of the audience foremost in mind. Another challenge was sorting through reams of existing content to choose what to migrate to the new site. For that, we used data-scraping techniques to drastically reduce the amount of manual sorting and data entry needed for the refreshed site. Website. The design we chose leveraged the treasure trove of original photos and videos MRC had in its archives from the many events it puts on each year, providing an authentic look and feel. We also built an attractive, robust events calendar and a page to direct visitors to a range of resources they might need through every step of recovery. Since MRC’s old website had good search engine optimization, we used URL redirects to keep their strong positioning in search. Video. To create an engaging, appealing initial entry into the site’s homepage, we sourced MRC’s original videos to create a video montage that showcases the many facets of MRC’s work in the community. Call us today to learn how we can migrate content from your old site to a fresh new website. 651.357.4174.